Large gaps in crosswalk/street on the south end of the intersection. Thank you for contacting the city of Mankato about this SeeClickFix request. Your request has been received and will be assigned a service request identification number. Thank you for contacting the city of Mankato about this SeeClickFix request. Your city of Mankato SeeClickFix request has been assigned service request identification number 19-03210-001. A notification is sent when the item is resolved. However, if an update or more information is needed, please contact staff at 311@mankatomn.gov, 311 or 507-387-8600. Crosswalk button (and entire mechanism) is on the ground on NW corner of Madison and Raintree. Thank you for contacting the city of Mankato about this SeeClickFix request. Your city of Mankato SeeClickFix request has been assigned service request identification number 19-03211-001. Multiple potholes along Range Street especially near the intersection with Butterworth and in front of the Vintage Mall. Thank you for contacting the city of Mankato about this SeeClickFix request. Your city of Mankato SeeClickFix request has been assigned service request identification number 19-03146-001. Thank you for contacting the city of Mankato. The city of Mankato has resolved this customer service request. Please contact staff at 311@mankatomn.gov, 311 or 507-387-8600 anytime additional service is needed. Coming out of the Civic Center ramp, the wooden walkway is slushy and very slippery. Someone fell this morning. Thank you for contacting the city of Mankato about this SeeClickFix request. 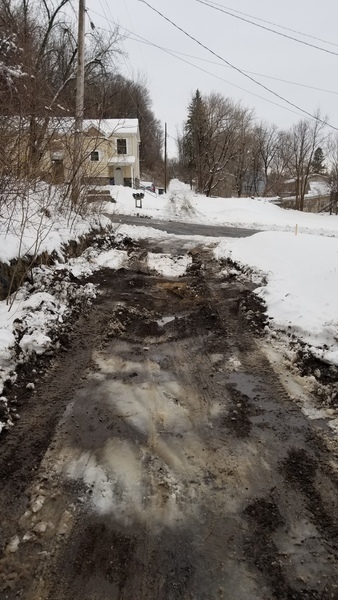 Your city of Mankato SeeClickFix request has been assigned service request identification number 19-03039-001.
alley way dug up from plow guy lowering blades. horrible. Thank you for contacting the city of Mankato about this SeeClickFix request. Your city of Mankato SeeClickFix request has been assigned service request identification number 19-03040-001. I dont know why but the wrong address shows up. This is supposed to be in the 500 block in behind 6th st. I don’t think the crosswalk button on the northwest corner of Adams and Raintree is working to cross across Raintree. It beeps, but the walk sign never comes on. I have tried it on three separate occasions. Thank you for contacting the city of Mankato about this SeeClickFix request. Your city of Mankato SeeClickFix request has been assigned service request identification number 19-02810-001. City staff is working on push button repair.